Using this drop-down list, you can specify one menu for the appearance on desktops and one menu for the appearance on mobile devices. With this setting, the application menu will not be shown. 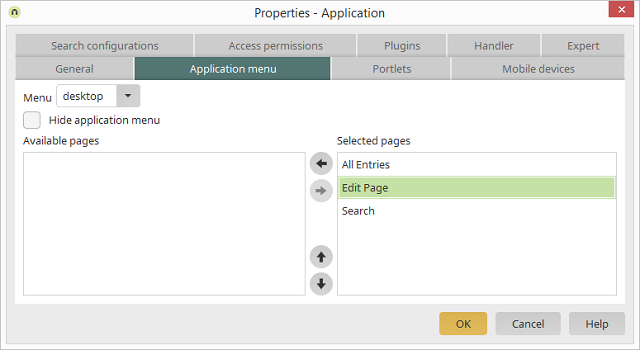 In this column, you will see all of the pages integrated in the application menu. Pages are moved from one column to the other. Changes the order of the pages. Here: The higher the position of a page in this column, the further left it will be shown in the application menu. If an edit page is directly called up from the application menu, it will be loaded with empty edit fields so that a new data record can be created.